Secuquest's VisionClear technology enhances visibility in real-time in fog, dust, lowlight, snow, smoke, subsea, etc. VisionClear works on images and video from Standard Definition and High Definition cameras, but can also be used in processing saved material. The SubSea industry has had to foster innovation in order to face the world’s most challenging environment. But, innovation has not always been synonymous with industry wide acceptance. The industry has, and to a large extent still are, dependent on divers. But that is very limited to shallow waters and limited operation times, and is still very dangerous.The solution is underwater vehicles, manned or remotely operated with remote vision through real-time video. The introduction of the Remotely Operated Vehicle (ROV) only came about as the industry understood the possibilities that the new technology delivered. Through the years the spectrum of ROV tasks has steadily grown and today it is the workhorse of SubSea operations. But, the industry must now face new challenges as its rapid expansion into deeper water and hasher environments pushes resources and current technology to the limit. To meet this challenge new concepts of operations and novel solutions are required. This is where VisionClear® comes in. VisionClear provides enhanced visibility to the remote operations. In real-time. Shortening operation times. Increasing quality of inspections and documentation. Pushing the usage of underwater video. In the past, inspecting under water was a difficult and expensive operation. The diver was often working in dark and turbid water and had to contend with currents, making it a particularly hazardous job. Today more and more companies are using ROVs to perform these inspections. Having an ROV allows them to perform an inspection whenever they want. In order to do this, water and environmental conditions must be established for the inspection. Of course, the inspector will want to find the clearest water and the least current possible for the inspection. But if the case is not a ship you can move to the most favorable conditions you are stuck with what Mother Nature provides. And the visibility is what it is. Or even worse, if you happen to stir up silt. This is where VisionClear™ products can make an important contribution. By reducing visibility problems you will get results where you would not without VisionCLear. This means higher quality in the inspection result, reducing inspection time and costs. Drastically. There are many reasons why underwater archeology can make significant contributions to our knowledge of the past. Some individual shipwrecks are of significant historical importance either because of the magnitude (such as the Titanic), or circumstances (Housatonic was the first vessel in history sunk by an enemy submarine). Shipwrecks can also be important for archeology because they can form a kind of accidental time capsule, preserving a collection of human artifacts at the moment in time when the ship was lost. Underwater sites are difficult to access, and more hazardous, compared to working on dry land. In order to access the site directly, diving equipment and diving skills are necessary. The depths that can be accessed by divers, and the length of time available for inspection, are limited. For deep sites beyond the reach of divers, submarines or remote sensing equipment are needed. Visibility may be poor, because of sediments or algae in the water or lack of light. This means that survey techniques that work well on land generally cannot be used effectively under water. This is where VisionClear™ products can make an important contribution. A large amount of all life on Earth exists in the oceans. Exactly how large the proportion is still unknown. While the oceans comprise about 71% of the Earth’s surface, due to their depth they encompass about 300 times the habitable volume of the terrestrial habitats on Earth. Large areas beneath the ocean surface still remain effectively unexplored. ROVs with cameras are rapidly becoming the standard non-invasive imaging tool for marine biologists. An ROV allows many more people to participate in the exploration of the deep sea while remaining in a safer environment. This high tech, motorized underwater camera has the ability to “swim” along the ocean bottom at any depth, allowing the scientists to closely observe the plant and animal life there. And it does not produce bubbles that scare fish. But because of turbidity and other visibility problems of the sea it is sometimes difficult to get quality data from the study. 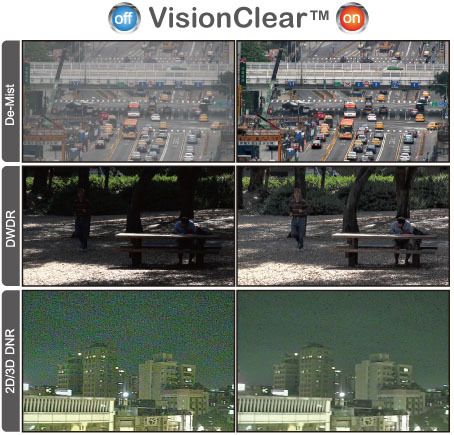 That is, if you are not using VisionClear™ real-time video enhancement. The ROV technology has proven its durability and versatility in missions around the globe. And now, with the commonly used micro ROV, inspectors can access tight places that are inaccessible or hazardous to divers. In even smaller spaces ruggedized micro and fiber optic cameras are used commonly. Every detail can be scrutinized. As long as there is visibility enough for a quality result. Better and better lights are mounted on the ROV or camera increasing usability. But sometimes this is not enough. The water might be so turbid that the strong light just creates overexposed “milk”. Strong tinting of the water might obscure the surfaces you are supposed to inspect. And how do you distinguish a corroded crack from the rest of the corroded surface? There are many customer cases verifying that you can push the limits of the underwater inspection technologies a few steps further by plugging in a SecuQuest unit in the existing video system. The result is reduced visual disturbances from particles or algae, removed predominant tinting from organic matter or minerals and increasing contrast in surface colours. The use of camera systems for search and recovery operations is growing since it is often more efficient that using divers. Especially when speed is of the essence, diver down- time can be a limiting factor and the operation is too dangerous to use human intervention.The growing need to secure ports and waterways also increases the use of camera systems. For both these applications increasing visibility can be a significant contributor to success of the mission. The use of cameras in the Aquaculture market is rapidly growing and fish farms are constantly looking at more cost effective means of monitoring their fish and feed residues. Environmental aspects on fish farming are increasing and legislation is more and more demanding video documentation of the sea bottom.